"Bishop Jakes is the quintessential with a heart for people in the now and an entrepreneurial vision for the church of tomorrow. Without hesitation I believe that Bishop Jakes is one of the best communicators in the world today. His ability to connect with people is God given, and I am personally inspired, encouraged, and challenged each and every time I am in his presence." -- Ed Young, senior pastor of Fellowship Church and author of "Outrageous, Contagious Joy"
The bestselling author, leader of a congregation of 30,000 members and a business empire, Bishop Jakes continues to teach and demonstrate ways to lead a prosperous and balanced life based on faith. 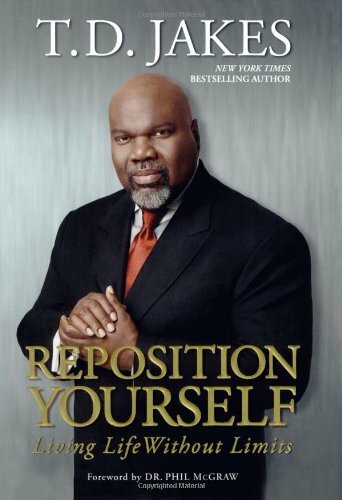 Grounded solidly in Biblical teachings, Reposition Yourself shows readers a way to apply the lessons of scripture in everyday professional and personal life - explaining how to re-evaluate and reconstruct their attitudes about giving, sharing and reaping life's rewards. Jakes is the bestselling author of 24 books that have won numerous awards, including the NAACP Image Award.